What To Do About Painful Blisters On Your Feet? Advanced Foot Care Advice / Blisters / What To Do About Painful Blisters On Your Feet? Summer is the time for walking around barefoot or in flip-flops or sandals. Maybe you love being outdoors in summer so much that you feel like walking all day long and walking to places where you would usually drive in less hospitable weather. This does a world of good to your health and to the health of the world. Unfortunately, it may also put you at risk for painful blisters on your feet. Walking itself doesn’t raise blisters. It’s walking the wrong way or walking without giving your feet a rest. People also get blisters if they have to stand up for a long time. You can also get foot blisters from sunburn, allergies and diseases such as chicken pox. 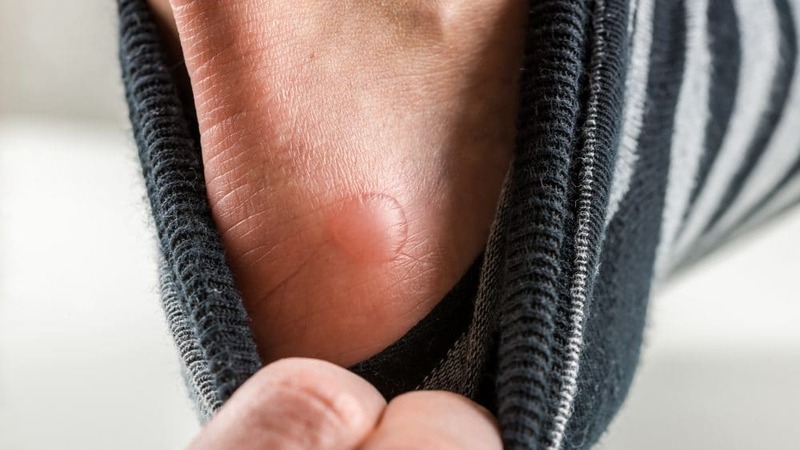 A blister is a little bubble of skin that’s filled with some kind of bodily fluid. It can be lymph fluid, plasma, which is the liquid part of the blood that has clotting factors, blood or serum, which is plasma without clotting factors. Blisters can also be filled with pus, which are basically dead white blood cells that help fight off infection. What Causes Painful Blisters On Your Feet? One of the main causes of blisters on the feet are shoes that are too tight or too loose and rub constantly against your skin. They can also occur because the shoes are so tight that sweat clogs the pores of your feet. The result of this can also be blisters. Most blisters heal by themselves, so you don’t need to see a doctor unless you think that the blister is infected. Generally, you shouldn’t pop a blister. The exception to this are blisters that are very large and painful and might become worse if they’re not popped. Some doctors recommend bursting blood blisters as well. In order to pop a blister, the implements you use will need to be very clean. This includes your hands. First, you need to sterilize a needle. All you need to do here is hold the needle in a fire until it glows red. You can also wash it with rubbing alcohol. Wash your hands thoroughly then wash the area around the blister. Use the needle to punch a small hole in it, and allow the fluid to drain completely. If pus drains, it’s a sign of infection, so you should make an appointment with your doctor. Don’t pull off the skin over the blister, for it is protective. Put a dab of antibiotic cream over the blister, and cover it with a bandage. Change it every day or when it gets wet or dirty. As the blister heals, keep watching for indications of an infection. You will see pus drain, red streaks running from the blister toward your heart or skin around the blister that is red, warm or increasingly painful to the touch. Notice if you have swollen lymph glands, chills or fever. Again, get in touch with the doctor if you see these signs. It’s also a good idea to see the doctor if you haven’t had a tetanus shot in about a decade. If the blister hasn’t popped on it’s own, put a bandage over it. If it’s at the bottom of your foot, put one of those donut dressings on it. If the blister has popped by itself, perform the procedure described above, but don’t treat the wound with harsh chemicals such as alcohol, iodine or hydrogen peroxide. Try not to wear shoes or walk around while the blister heals, but put on a thick sock to protect the blister. If you live in the Long Beach/Los Angeles/Palos Verdes area and are a bit worried about a blister on your foot, call the Advanced Foot and Ankle Center for a consultation. Podiatrist Dr. Pedram Aslmand is pleased to serve patients who suffer from foot problems. For more information call (562) 426-0376.